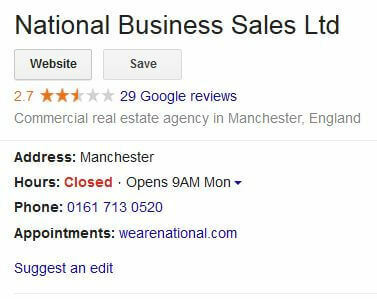 The company that refers to itself as National Business Sales is actually ​National Business Sales Ltd. On first appearance it seems this company was registered in 2000 and has been operating as a business broker since then. But a closer look reveals some interesting information. ​​According to Companies House, this company was called Sovereign Cleaning Services Ltd from Jan 2000 to Dec 2017. In December 2017 it seems to have been sold from a Jonathan Robert Leslie Bean to a Daniel Charles Smith who changed the company name to National Business Sales Ltd and changed the nature of trade from cleaning to business brokerage. In the year prior to these changes this company's accounts showed a b​ook value (net assets) of just £64 so it's likely the company was bought for little to nothing. ​Buying a company and changing the name / nature of business may have the effect of giving the casual observer the impression that the company is a long established business as it would allow for claims such as "registered since Jan 2000". However, one would be wise to dig into the history of the company before concluding that this firm has been involved in business brokerage since the year 2000. 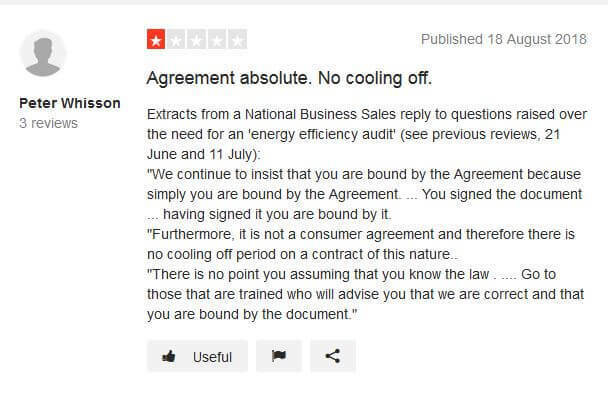 Just to be clear, we have not seen any public declarations from National Business Sales Ltd claiming a long history with the sale of businesses. ​This review was written in ​August 2018. Some of the information below may be out of date. You should always seek the most current information and conduct your own research; we've provided some links below to assist you. Please also see our guide to interpreting reviews. Address: 74 Dickenson Road, Rusholme, Manchester, M14 5HF . There are 17,848 other companies registered at this post code which suggests it may be an "accommodation address". Social Media: They have a LinkedIn page with 8 employees on LinkedIn (though they claim on that LinkedIn page to have "51-200" employees). It may well be that many of their employees are not on LinkedIn. They have a Twitter account with 658 followers and a Facebook presence. How they get clients: There are numerous complaints online about cold calls from National Business Sales. On various review sites (more below) clients and prospective clients have complained not just about the frequency of the cold calls but also about rude callers and about National Business Sales not removing the recipient from the database when requested. Valuations: National Business Sales Ltd provide free valuations to business owners but the examples we have on file suggest their valuations are somewhat unrealistic. ​Their client feedback on various sites suggests that clients have often discovered, after many months of fruitless efforts, that their business wasn't selling because it was significantly overpriced. We do not comment on whether these unrealistic valuations were genuinely provided by National Business Sales in good faith or whether they were deliberately excessive in an attempt to persuade clients to sign on the dotted line. Company records, director information and financials (balance sheets etc): You can get information on this company from the free service at Companies House: National Business Sales Ltd.
​​Reviews for this company don't paint a pretty picture. Many reviewers claim that this company is a rebranded version of RTA Business Sales and/or run by the same people. There are 29 reviews at Google scoring them an average of 2.7 out of 5. There are 6 reviews at Trustpilot scoring them a 2 out of 5. Note: ​We do not provide legal advice but would recommend you have the contract vetted by a lawyer before signing it. ​There are several elements of the contract about which we feel deeply uncomfortable. ​Errors & Omissions: If there is any information on this page that you feel needs to be corrected, or other important data that you feel needs to be included, please contact us.